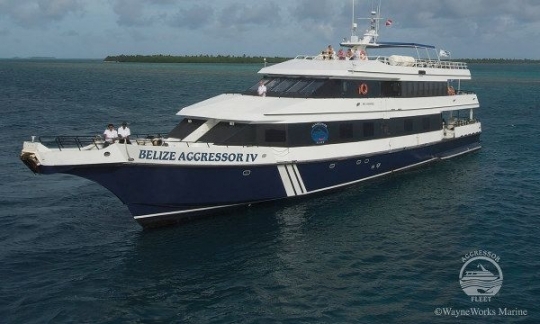 The Belize Aggressor IV is part of the worldwide Aggressor Fleet liveaboards and, as anyone who has experienced a cruise with Aggressor Fleet knows, you can expect high levels of service and reliability. 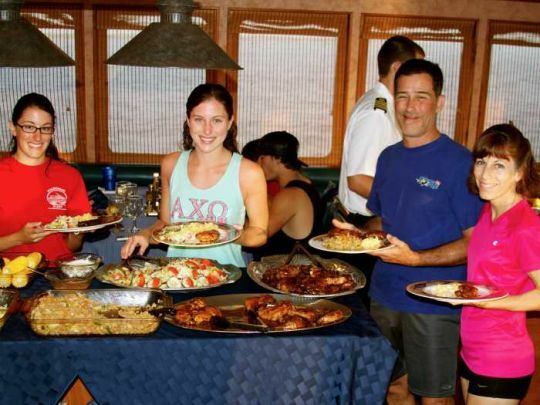 It is a large and stable 138 foot motor boat that accommodates up 20 guests. At a top speed of 14 knots you can be whisked from one great Belize dive site to another in next to no time. 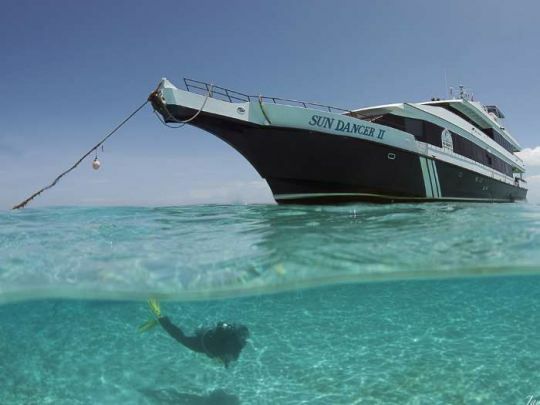 These liveaboard safaris depart from Belize City, ideally taking in the south of Turneffe Reef, Long Caye, the Blue Hole and Half Moon Caye at Lighthouse Reef. Nitrox is available so you can maximize your time underwater, and there is 16 foot 'deco bar' to assist scuba divers make their safety stops. These are especially useful when you consider that the Belize Aggressor IV makes up to 5 dives per day. Photographers will appreciate the charging station, camera rinse tanks and camera table. 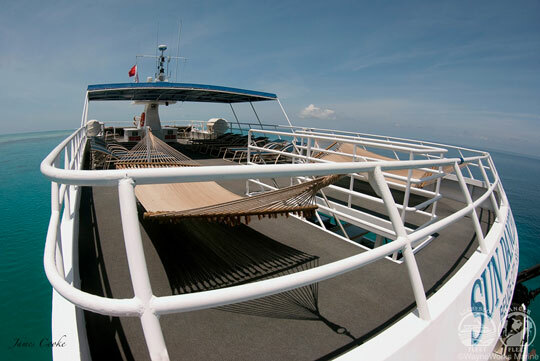 The non-slip dive deck also features a toilet and hot showers for those who like to rinse off soon after surfacing. 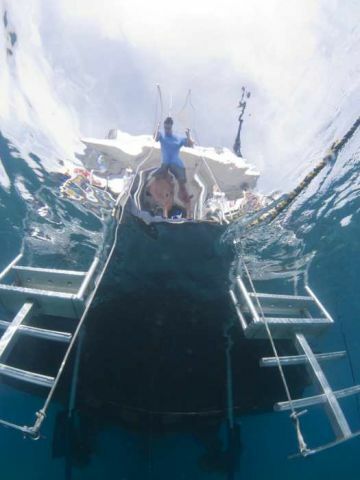 All divers are welcomed back onboard the boat after a dive with hot towels and fresh orange slices. 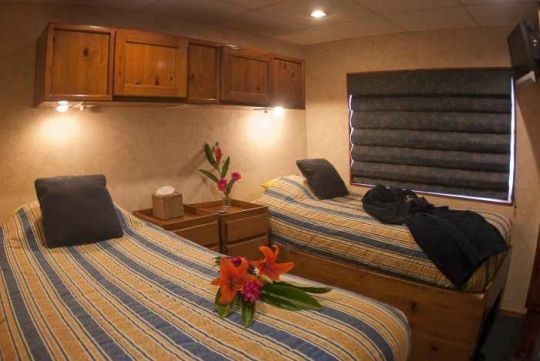 Most of the cabins on the main deck - each with a large seaview window, en-suite bathroom, flat screen LCD TV and DVD player, and air-conditioning. 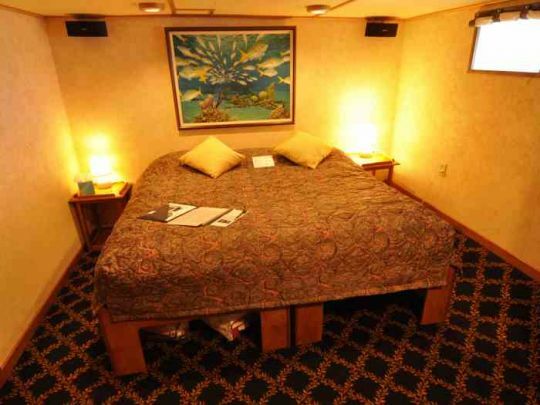 Bed arrangements are double or twin; there are no cramped bunk bed staterooms on this boat. The saloon features full entertainment facilities: TV, DVD, music system, PC and Mac. Wine and beer are complimentary onboard. There is also plenty of reading material, both marine and general interest. 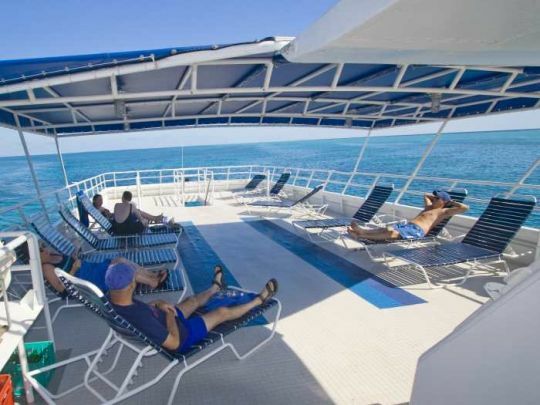 Considered one of the most spacious of the fleet, Belize Aggressor IV has plenty of room in which to relax including the sun deck, shaded upper deck and air conditioned saloon. 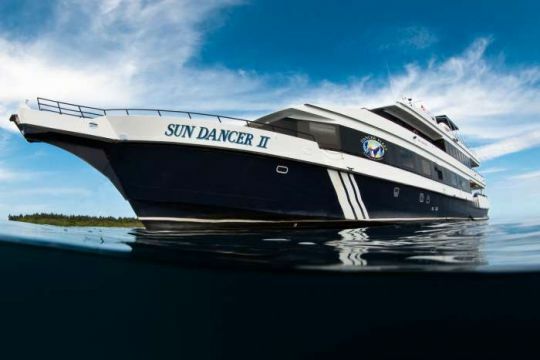 To dive Belize in liveaboard luxury and style, the Belize Aggressor IV is a great option. Cruise price per person includes: Cabin accommodation with air-conditioning, breakfast, lunch, dinner, snacks, water, soft drinks and hot drinks, local wine and beer, return transfers to the boat from Belize airport on boat departure and return dates, dives (as detailed in the trips above), experienced English-speaking divemaster(s), tanks, weights and weightbelts. How to get there: The Belize Aggressor IV departs every Saturday from the Radisson Fort George Hotel Dock. Guests will be transported in an air-conditioned van to the yacht. For more information see our Belize travel information section. The first and last nights of the itinerary are spent in the harbor. The last dive of the trip will be at around 11:00 hrs the day before disembarkation. 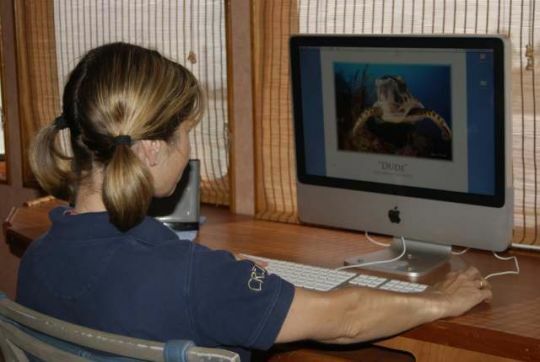 Please wait at least 18 hours before flying after diving. Dive clubs and group discounts: Pay for 8 guests and 1 additional person can join the cruise in a Deluxe stateroom free of charge (total 9 or more guests). Full charter: Pay for 18 guests and 2 additional persons can join the cruise in a Deluxe stateroom free of charge (total 20 guests). 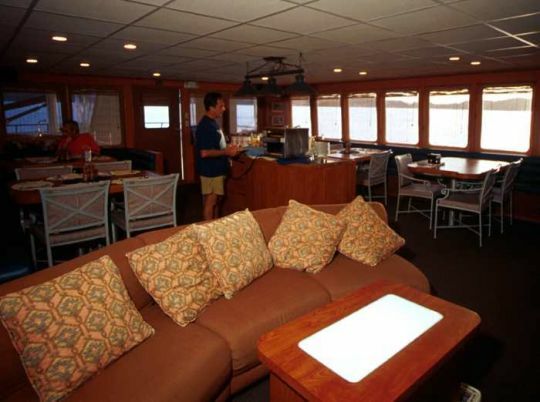 The Belize Aggressor IV has a total of 10 staterooms. 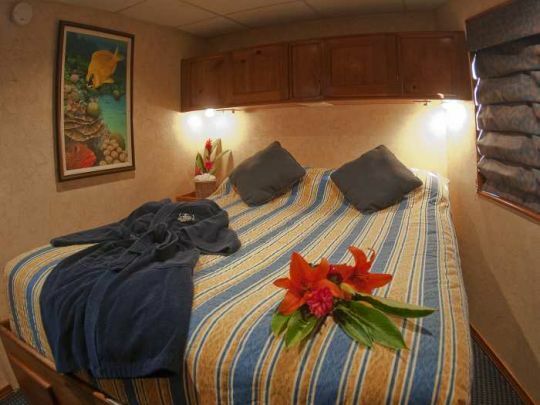 There are 8 Deluxe twin/double bed staterooms with 2 twin beds or 1 king. The 2 Master double bed staterooms have queen beds and large windows. 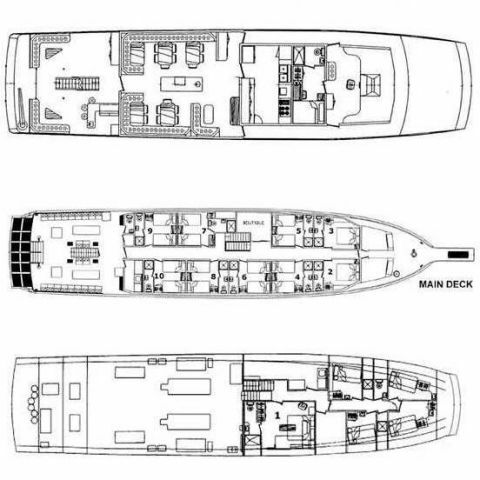 All staterooms are on the main deck except 1 Deluxe twin/double bed stateroom with porthole on the lower deck. All these staterooms have private bathrooms and entertainment systems. Staterooms have a daily turn-down service and guests receive a stateroom wake-up coffee service. The lower deck stateroom is larger than the main deck staterooms but lacks a seaview window. The Belize Aggressor IV's onboard chef prepares a menu of international dishes made with a touch of Central American flair, all washed down with complimentary beer and wine. The chef has earned an enviable reputation as the best among the whole Aggressor fleet! Central American and international meals, as well as a BBQ. Dinners are 4 course meals served in the indoor air-conditioned dining area. Continental pre-breakfast, cooked breakfast, lunch and dinner, with snacks in between. Coffee, tea, soft drinks, wine, beer, drinking water, fruit, cookies are provided free of charge.